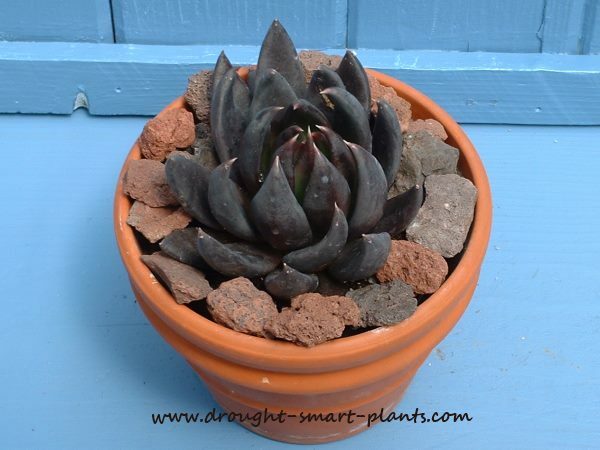 The very distinctive colour and shape of Echeveria ‘Black Knight’ make this one of the very darkest Echeveria. The rigid dark purple to black curved cylindrical leaves form a stiff rosette. Imagine this variety combined with other dark coloured Echeveria like 'Black Prince' and 'Chocolate Ruffles' and some unrelated plants like the deepest purple Setcreasea, the black potato vine 'Blackie' and some really dark taro varieties; it would be absolutely stunning as a patio planter for a summer display. 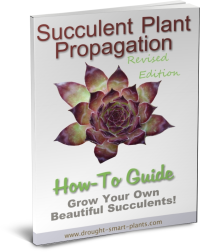 As usual with all the Echeveria hybrids and varieties, keep this plant on the dry side, watering thoroughly then allowing it to dry. Use caution if it's in a combination planter, as the watering schedule can be somewhat challenging - it's a fine balance between enough water for the other types of plants, and what's best for plants that have evolved to survive on less water. However, well drained soil overwatered will cause less harm than a soil that holds too much moisture. 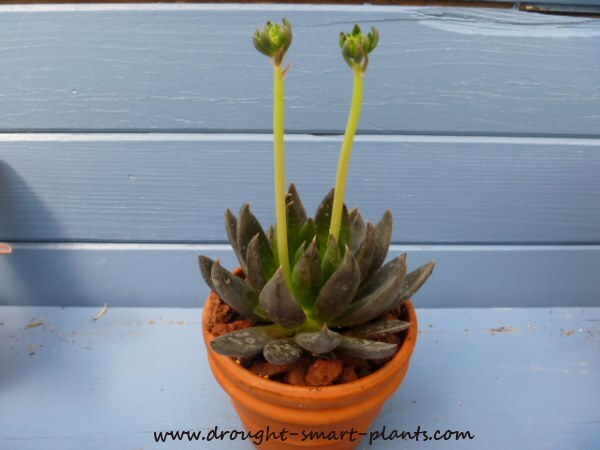 I like to plant all Echeveria in the terracotta clay pots as they dry out quickly which prevents root rot. The air movement through the clay is beneficial to the roots too, eliminating the stagnant soil which is so bad for any of these plants. The colour combination of the dark purple spiky foliage and the orange terracotta pots is exceptional too. For the best and darkest colour, keep this plant in a brightly lit location. With luck, and in time, long spires with clusters of red to orange blooms will emerge. What an eye popping sight that is, when there are several sprays of these blooms emerging over about a month or so in late summer. Once they've shriveled, you can cut them off close to the base to tidy it up. 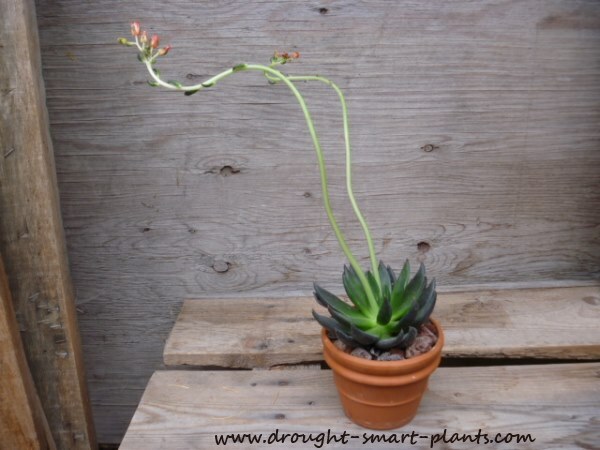 Although this plant is slow to form offsets, if it's rootbound for long enough this will force the lower stem to branch into small rosettes. Cut the top off, and many smaller ones will start to break below the cut. Each one of these will be a new plant once roots form.